Ontario Bakery: 5 Games to Play with Your Preschooler that Are Fun and Better Their Motor Skills! We love hanging out with pre-schoolers. They say and do the funniest things! At Ontario Bakery, we love supporting families growing together and know that the journey can be a challenge at times. Sometimes, it's health, sometimes it's development. So, along the way, we've gathered together 5 of our favorite fun activities that you can do with your preschooler or young child that they will enjoy and also gain the benefit of improving their fine and gross motor skills. An adult or game leader can give some directions like “run to the big tree, touch the bark, and come back,” or “run over to the slide, go down one time, and come back” or “run around the tree three times.” Great not only for gross motor skills, but for listening carefully and following directions. Feel free to use less commands in the beginning and make them more challenging as you go along. Take off your socks and shoes and pick up small toys with your toes and put them in a bucket. For more skilled preschoolers, try picking up all of the yellow objects, then the blue, the red, etc. This is such a fun one and a great way to make cleaning more fun, when you can put toys away or clothes in the laundry. Blow up several balloons and toss them back and forth. Try moving closer to each other and farther away from each other. Try using different body parts (hands, elbows, heads) or blowing the balloon up in the air. See how many times your preschooler can bounce the balloon up before it falls to the ground. This is good because it also gives the small child a chance to be coordinated, as the balloon spends more time in the air. It's easy to invest in several different colored hula hoops. With this one, simply lay them on the ground. Next, give the child or children fun instructions such as “run to the red hula hoop and pretend to be a car,” or “hop over to the green hula hoop like a bunny.” They'll learn colors while exercising their fast thinking muscles too. Saving a favorite for last, take out some sidewalk chalk and draw large shapes, letters of the alphabet, numbers, etc. 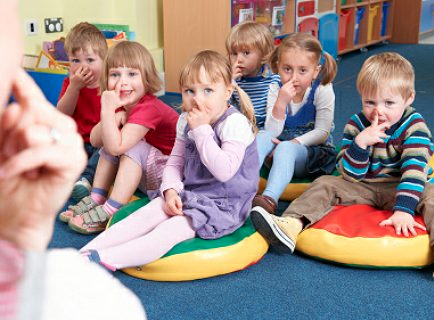 Then proceed with commands such as, “Simon says stand on the yellow square,” or “Simon says sit on the number 5.” For older or more ready children, try commands that have multiple steps, like “Simon says run to number 14, then hop over to number 20.” This is a fun way to work on recognition of higher numbers, lowercase letters, and memory. As you can see, playing and engaging with a preschooler can be easy and fun while also helping them grow healthy, smart and strong! At Ontario Bakery, we believe that childhood should be celebrated! It's not always easy being small and feeling limited, so why not congratulate their efforts with an ANYTIME party? These parties need no birthdays or holidays, just a a child to love, recognize and applaud. We'd love the honor of providing the most delicious cookies, cupcakes and even custom cakes for these fun anytime parties! We hope you've enjoyed these tips and look forward to baking for you!